Do you have a hero? Do you have a mentor in life? I think we all have someone we look up to and who are inspired by each and everyday. Heck, it may even be a handful number of people that you consider your mentor. The mission of Ocean Futures Society is to explore our global ocean, inspiring and educating people throughout the world to act responsibly for its protection, documenting the critical connection between humanity and nature, and celebrating the ocean’s vital importance to the survival of all life on our planet. There was a rush for his autograph after his speech, and I decided to wait patiently for an hour for the crowds to die down. I wanted my meeting to be memorable, and last more than 1 minute. And let me tell you, it definitely worth the wait. Whilst waiting, I got to have some great conversations with JMC’s right-hand woman with his Ocean Futures Society, Holly Lohuis. She’s been working with the Ocean Futures Society for the past 15 years as the field producer/executive coordinator for JMC. She’s a marine biologist, educator, and passionate ocean conservationist. My friend Josh who was with me at the show, said that she reminded him of what an older version of myself would be like. I take that as a huge compliment! 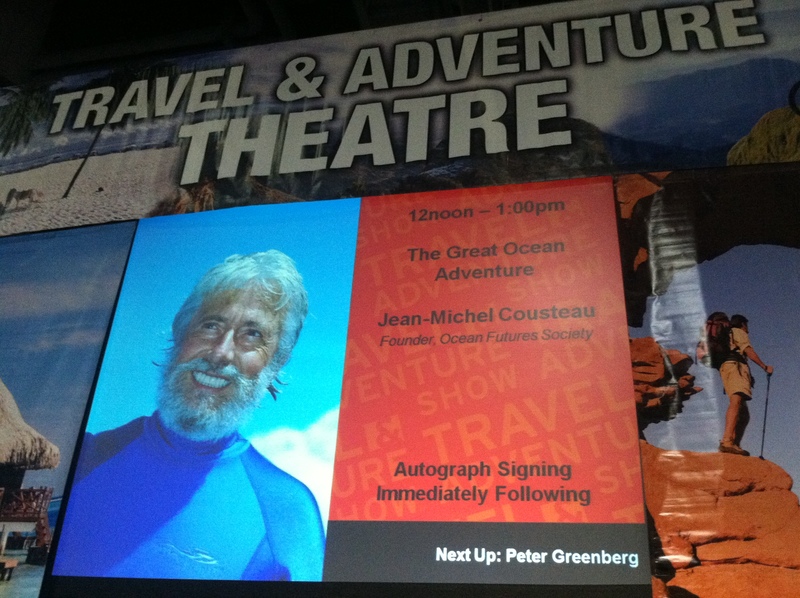 Some younger girls and boys approached JMC and told him that they wanted to be a marine biologist just like him. And my heart smiled when I heard Jean-Michel say, “Don’t listen to what anyone else says. Do whatever you love.” Not too long ago that little girl was me… and I have wanted to be a marine biologist since I was 5 years old. After years of Sea World Camps, marine biology field courses in Baja, and lots of hands-on volunteer experience with numerous marine organizations, I can happily say that I followed my dream. I earned honors receiving my Bachelors of Science Degree in Marine and Coastal Ecology, and I couldn’t be more happy. Now I just need to find a job that sums up my love and passion for the ocean and marine science education…let the job application process continue! In 2005, the Ocean Futures Society teamed up with Ritz Carlton hotels around the globe to exclusively home JMC’s Ambassadors of the Environment program. The Ambassadors program, “provides educational, outdoor adventures to guests and the local communities of The Ritz-Carlton, Grand Cayman, The Ritz-Carlton, Kapalua, The Ritz-Carlton, Laguna Niguel, and The Ritz-Carlton Reserver, Dorado Beach.” I have actually been in the interview process for the a couple Ambassadors programs at the Ritz-Carltons listed previously, and when I disclosed this information to JMC, he was super impressed by my determination and dedication to be a part of his marine education program. He autographed a very kind and personal message in my book that I will cherish forever, and told me to keep in contact about the Ambassadors program. After that, I was on Cloud 9 for the rest of the day 😀 Josh and I walked around the whole Expo entering in every contest possible to win dream vacations. Between the two of us, we are hoping the odds are in our favor to win at least one of the contests haha! So my fantasy as a little boy growing up in Slovakia, was to be like Mike Nelson on Sea Hunt, and be able to live underwater most of the day, and experience the beauty of the underwater world, and be able to swim like a fish, etc….so the character, the diver, became my so called mentor. 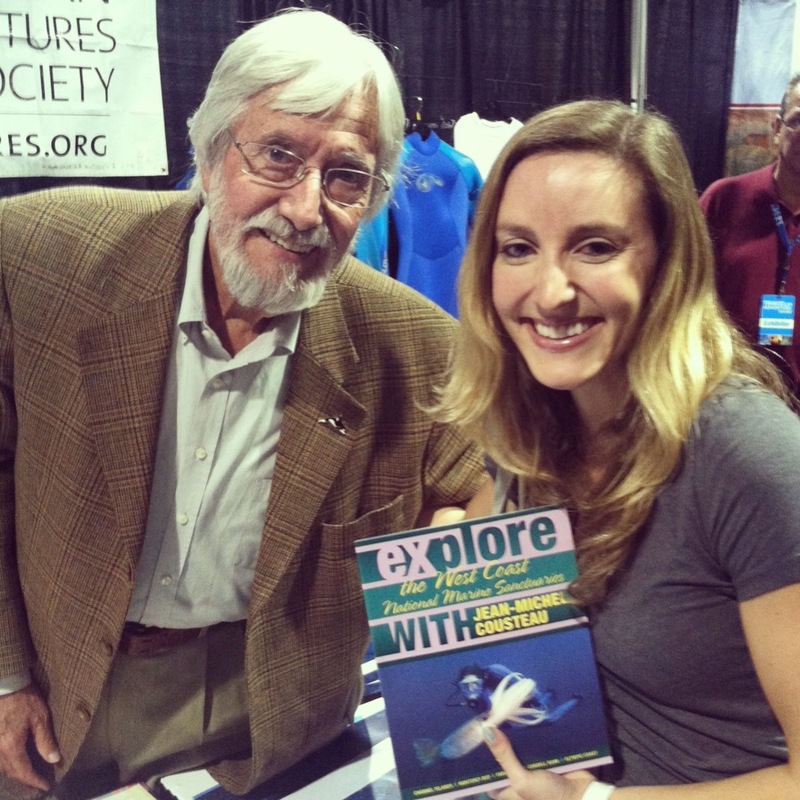 I am glad you met one of the world’s top knowledgeable individuals, Jean-Michel Cousteau, the son of the famous ocean explorer, Jacques Yves Cousteau and I hope one day he becomes your mentor. My father was my first mentor in my quest to become a professional soccer player, but I also had another mentor in my life, and it is an experience I will never forget…he did become my second father figure, he even wanted to adopt me, regardless if he already had a total of 10 kids of his own…his name was Sr. Fernando Daucik during my soccer days in Spain.. Unfortunately he is already deceased, but I will never forget the experience, I learned a lot from him as I did from my own father. Even my father idolized him as one of his mentors and heroes. 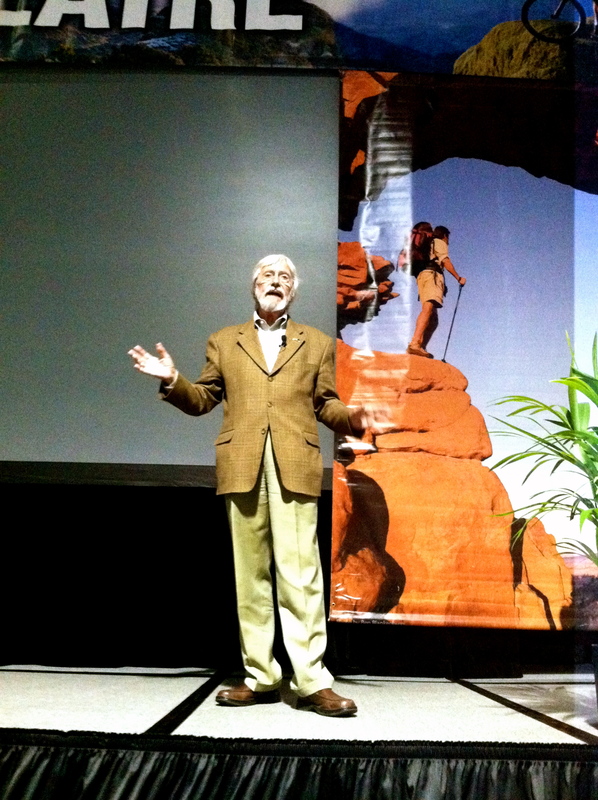 I would love for your to experience such a mentor as that of Jean-Michel Cousteau.